The Los Angeles area is blessed with a plethora of world-class theme parks within short driving range. As a resident with a free day you have your choice of Knott’s Berry Farm, Lego Land, Six Flags Magic Mountain, Universal Studios or the world-famous Disneyland. During the Halloween season each of the theme parks offers a special treat for visitors. Knott’s Berry Farm features The Knott’s Scary Farm Haunt with an array of mazes designed to scare as well as specialized scare zones throughout the park. This attraction is not recommended for children under the age of 13 and does not allow any costumes. Lego Land offers two different types of Halloween events: daytime and nighttime. The daytime events feature their “Brick or Treat” trail which allows children to trick or treat, in costume at various locations throughout the park. There are also a wonderful collection of Lego “sculptures” that are Halloween themed, ideal for photo opportunities. Lego Land’s night time fun features a costume contest, a pumpkin building challenge and a Halloween dance. Nighttime and daytime events at Lego Land require separate admission. For older teenagers and adults Six Flags Magic Mountain offers its Fright Fest attraction for 12 creepy nights in October. Fright Fest features mazes, ride hauntings, roaming zombies and creepy themed shows and has a separate admission price. For the younger children there are special Halloween themed events in Looney Toon Land that are appropriate for all ages. Universal Studios in Hollywood offers Halloween Horror Nights with five new frightful mazes, assorted scare zones and a terror tram that features Peter Jackson’s new 3-D version of King Kong. Disneyland offers Halloween Time at Disneyland with wide assortment of Halloween fun for the whole family. The entire park is decorated with orange and black and pumpkins a la Disney are prominent throughout the park for all your fall photo needs. The Haunted Mansion reverts to its Nightmare Before Christmas mode and the Big Thunder Ranch features expert pumpkin carvers and Halloween crafts with Woody and Jessie from Toy Story. 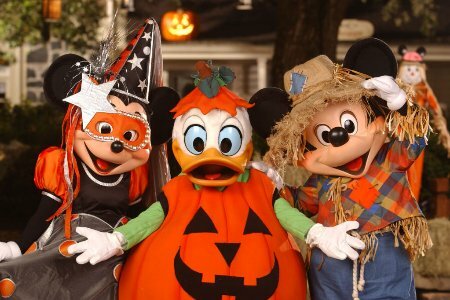 There is also a Mickey Halloween party, with a special admission price that allows children to trick or treat with Disney Characters and enjoy a special themed Halloween party. Each park offers its attractions at different times and there are often additional costs or restrictions involved. Make sure to check the theme park’s website before planning your Halloween outing. I’m Carol Wolfe and nobody does it better.